DERBY COUNTY | Carson, Christie, Keogh (c), Hendrick, Martin, Russell (Weimann 56), Shackell, Johnson (Blackman 88), Butterfield, Olsson, Thorne (Ince 56). SUBS | Grant, Buxton, Bryson, Hanson, Blackman, Ince, Weimann. WOLVES | Ikeme; Iorfa, Batth (c), Ebanks-Landell, Doherty; Coady, McDonald, Saville; Byrne (Mason 75), Helan, Sigurdarson. SUBS | Martinez, Hause, Rowe, Price, Hunte, Mason, Le Fondre. toe to toe for ninety minutes and it payed off!! the best win this season ! 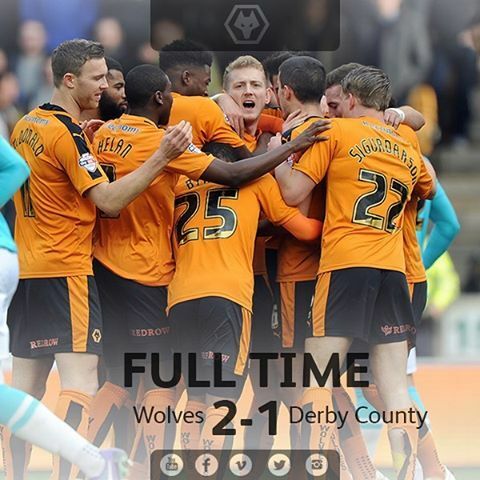 F/T 2-1 Wolves! GET IN!!! Where did those 5 come from? !